OVERVIEW– With a new rally confirmation in hand for the indices registered on Friday, we look to some of the stronger stocks that we have been keeping an eye on during the most recent downturn for possible new long trades. However, the list of leading stocks that are set to break out of proper, solid base formations have been thin, and many have wide and loose formations that lead to a higher than normal breakout failure rate, so conditions are by no means perfect right now. Confirmed uptrend or not, traders still need to trade with caution and move slowly, if at all, into new long positions, preferably with lower than their normal risk. Here is a detailed look at one of our top stocks from this weeks watch list, along with its current EPS and RS rankings from Investors.com and IBD. Perhaps the most solid technical set ups we see today belongs to Atlassian Corp. The stock belongs to the Software/Spec Enterprise group, one of the few growth industry groups sitting near the top of the leading industry group list according to Investor Business Daily, ranking 26th out of the 197 groups monitored. After peaking at $98.21 on October 1st, the stock has since carved out a third stage base cup and handle pattern, and at a closing price on Friday of $87.09 sits 3% below the pivot point of that base at $89.82. While some further volatility contraction would be ideal before any breakout, the stock is worth consideration for a long trade on a move above the pivot point on an notable increase in trading volume, preferably 2,000,000 shares, or better as long as the general market conditions are supportive. Remember to never initiate a new trade more than 5% above the stocks pivot point, and preferably much lower. Other stocks that we alerted to members this week include DATA, TWLO, CIEN and QNST. To get analysis on these stocks and much, much more, join us for a free trial today at http://www.ttptrading.com See you there! OVERVIEW- Market indices staged a huge rally on Friday and in the process registered a confirmation on day seven of the initial rally attempt on 12/26, thus signaling a new uptrend. The large gains posted by the Nasdaq and S&P 500, coupled with an increase in trading volume over Thursdays session in the S&P, technically gave us our confirmation day. However, before traders hit the ground running with new long positions, we must note that not all newly confirmed rallies succeed. Most recently, the two new rallies that were confirmed in November both failed quickly as indices went on to register new lows. Additionally, the indices have much more work to do repair the technical damage that was done during the latest correction. The first thing we would like to see on a technical basis is the indices remount their 50 day moving averages. As I have stated many times, bull markets live above their 50 day moving averages and bear market toil below them. Additionally, we need to see more growth oriented stocks breaking out of sound basing patterns and to this point we have little evidence of this. There are some small areas of strength in this department however, particularly in the software group where a few select stocks have been forming decent bases. In short, we need to see some new industry leading groups emerge and some leading stocks within these groups start to fire higher out of sound basing patterns to give this new uptrend a chance of lasting success. Of course, we don’t know if the third time is a charm for this latest uptrend confirmation, or how long lived its success may be, but we will monitor the indices now for signs of distribution to help us gauge the recovery. In the meantime, some caution is still warranted and traders should venture back in to the markets on the long side very slowly, with lowered position risk focusing particularly on stocks that have held up the best thru this correction and ideally are part of a leading industry group, or the groups that are starting to make their way up the list very quickly. Bear markets can spawn sharp rallies that lure eager traders in too quickly causing numerous whipsaws that eat at their account values, so patience is still required before getting too heavily involved on the long side. The possibility exists that this new uptrend unfolds slowly as the indices mend the previous damage caused by the prior sell-off, or perhaps we will see another failed uptrend, but whatever the outcome continue to build your watchlist focused on high relative strength stocks that show superior sales and earnings growth while keeping a keen eye on the particular industry groups that show the strongest strength. With that let’s take a look at the four indices we cover here as we head into the first full trading week of 2019. That’s all for today. I will be back tomorrow with our Weekend Trading Review for our premium members at our premium site. Join us for a free trial at http://www.ttptrading.com See you there! Friday was day seven of a new attempted rally that began on 12/26, and today that rally was confirmed with large gains posted across the board on all major indices. It was a close call as NASDAQ volume looks like it will fall short of yesterdays levels, but the NYSE volume showed an increase which is enough to signal a confirmed rally and a new uptrend. But before you go on a stock buying binge, know that confirmed rallies can, and do fail. The two most recent confirmed rallies that took place in November both failed quickly with the indices ultimately going on to mark new lows. Additionally, there is an absence of high quality growth stocks breaking out of well formed bases, so the markets may need more time to heal before any new uptrend gets going in earnest. Despite the new signal, capital preservation and patience is still key in this volatile market, so limit any new buys to leading companies in leading industry groups and dip your toe into the waters slowly until the markets prove themselves further. Check in here tomorrow afternoon for this weekends full Weekly Market Prep analysis for next week. We use the CANSLIM trading methodology to find stocks we want to trade from a long perspective, but by using some of the methodologies metrics inversely, we can sometimes find stocks that are ripe for trip to the downside. One of the primary drivers using this trading technique to find strong growth stocks we may want to buy are sequentially strong annual and quarterly earnings per share numbers, but what goes up over time can sometimes come crashing back down when that earnings growth slows, or even stops. Casella Waste Systems (CWST) posted a long series of strong quarterly EPS growth from late 2015 thru mid 2017, and this earnings acceleration ignited several breakouts along the way with the stock chalking up gains of nearly 600% by late 2018. However, big advances can get long in the tooth as earnings growth stalls. Over the last three quarters Casella, which had made a habit of posting triple digit earnings numbers, now shows some serious earnings deceleration posting quarters of 0%, (-12%) and 0% EPS figures. The stock did break out of a very late fifth stage base in July, but an even later sixth stage base the stock had been working on in the fall has appeared to fail. 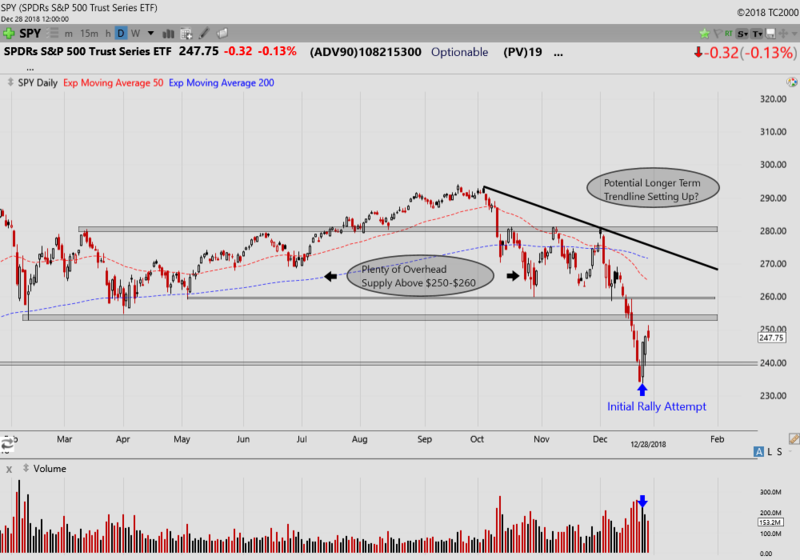 We can look further into the volume pane on the chart and see several weeks of heavy distribution during this period that gave us clue that the health of this base was in question. 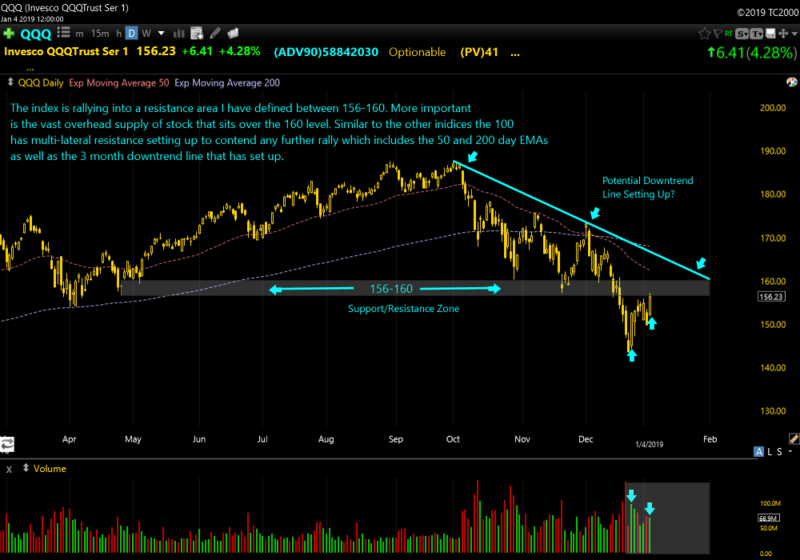 This base failure ended with the stock crashing thru a nearly two year long uptrend line just before Christmas, but the stock is in the process of a weak recovery attempt that is approaching a bi-lateral area of possible resistance just below the previous uptrend line and the bottom of the previous base setting up a possible short trade candidate. If you would like to learn to trade using the CANSLIM trading process, join us at http://www.ttptrading.com. Hope to see you there! OVERVIEW- The indices put a temporary stop to the intense selling late in the week, and in the process registered an attempted rally on Wednesday. It was good to see the indices finally firm up, but there is much work to be done before any type of victory can be claimed by the bulls. History shows counter trend rallies in corrective, or bear markets can be fierce. Short sellers need to respect the ability for the markets to wipe out any gains they may have racked up, or worse send them scrambling to cover momentum style positions they may have taken at losses. Conversely, long traders need to let markets prove themselves, at a minimum with a follow thru day after an attempted rally, before getting too aggressive as we have already seen two confirmed rallies fail in November. The recent 12/26 attempted rally can set up a potential follow thru day as soon as Monday, but again, not all attempted rallies ultimately lead to a tradable uptrend. 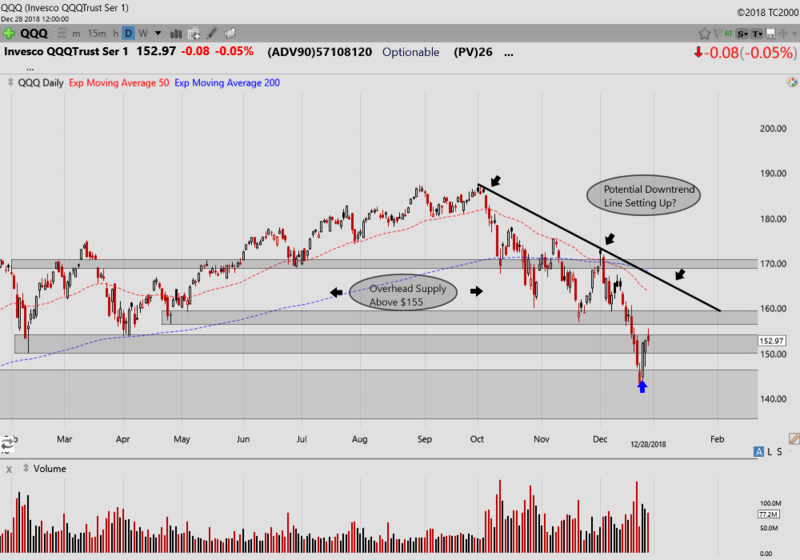 Additionally, an new lasting uptrend will need a group of leading stocks to ignite the move, and unfortunately many potential new leaders are still in the earlier stages of setting up reliable base formations, so perhaps more healing time is needed before any meaningful rally can develop. The current IBD industry group leaderboard is still being dominated by defensive type names however, some software groups have been holding up well, and this growth oriented area of the market may have the ability to lead any move higher in the indices, so we will be watching this area with great interest. There is no doubt that we are in a clear downtrend until proven otherwise, and the indices do face some challenges on any move higher, but things can change, and what may seem to be insurmountable near term challenges can be overcome quickly, so it is paramount that traders remain flexible to any changing market dynamics. With that, let’s take a look at the charts. SPY- The S&P 500 ETF rose nearly 3% for the week and held serve at longer term support near $240 spurring on new attempted rally on Wednesday, so we can begin to look for a confirming follow thru day as soon as Monday. The best follow thru signals occur on days four thru seven of an attempted rally, so with a holiday session on tap Tuesday, the indices will have all of next week to post a follow thru session. 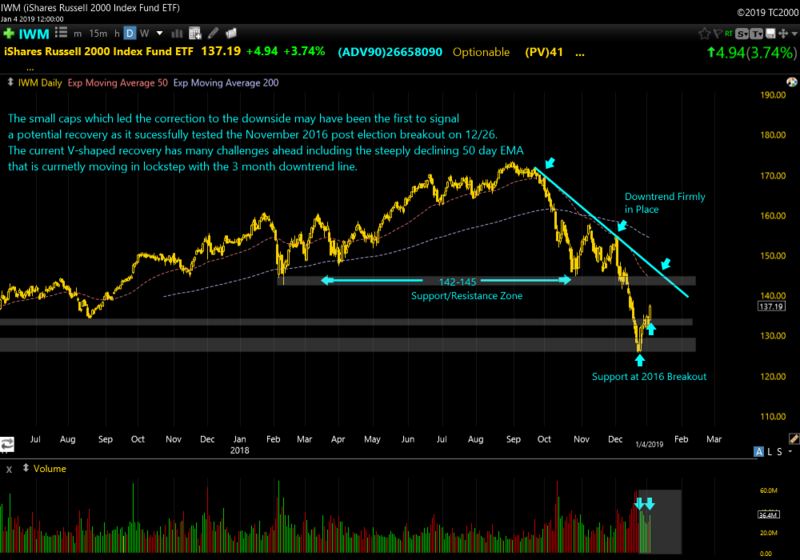 It must be noted however, that any new uptrend will have some serious technical hurdles to overcome. Indices are still swimming well below their 50 day moving averages, and have an abundance of overhead supply to deal with. 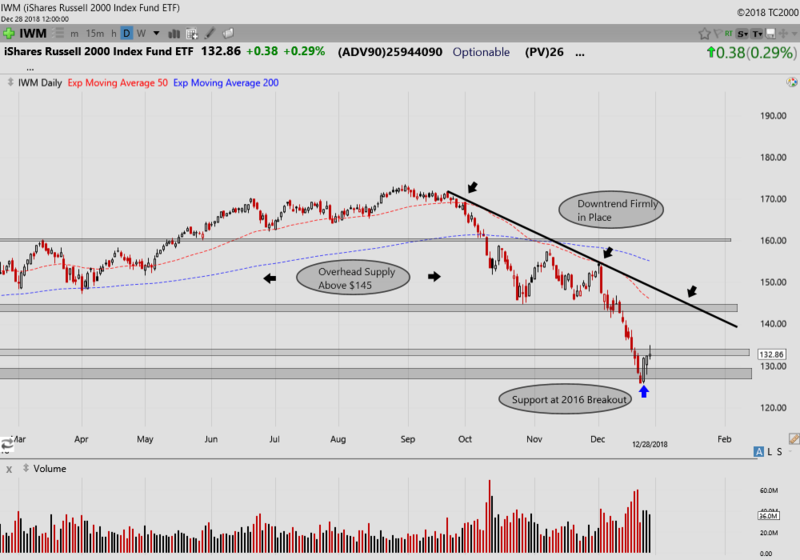 For the SPY, that thick layer of resistance begins near $250 and runs up to the old summer breakout area near $280. Remember, while the indices may have some hurdles to overcome, focus on the leading stocks on any confirmed rally because these stocks can still perform, provided they breakout of sound basing patterns, while the indices are still chewing away at resistance levels on their recovery attempt. NASDAQ- The Nasdaq fought off the late selling Friday afternoon just enough to squeeze out a gain, making it three straight for the index. However, the rally was turned away right at a layer of resistance between 6630 and 6800 that dates back to the 2018 February and April lows. Like the S&P 500 the Nasdaq Composite has much work to do to return to former glory, but most new leading stocks will originate from this index, like the aforementioned mention software group, so as always we pay particular attention to this area of the market for new trading ideas. In the meantime, the index has plenty of overhead supply to deal with between 6800 and 7500. QQQ- The Nasdaq 100 cut hard thru the $150 support level on Tuesday, but quickly recovered during Wednesdays rally attempt. The index followed thru late in the week, but was also turned away right at resistance near the 2018 April lows. It too will have a thick layer of resistance to fight thru on any recovery attempt. The 100 may present the most interesting case going forward as it tries to mount a new, lasting uptrend. 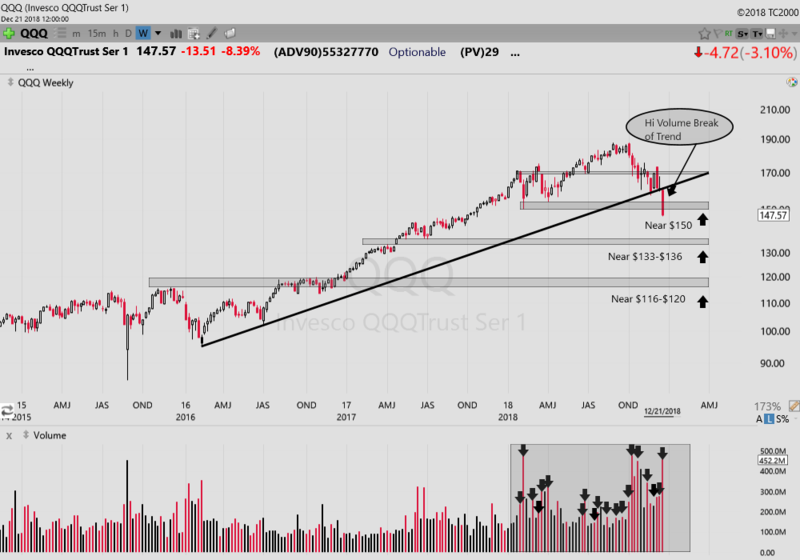 The prior bull run was primarily fueled by the heavily weighted FANG stocks, but in most cases, new uptrends that commence after bear market conditions will be led by a new group of leading stocks, rather then the prior leaders, so it will be interesting to see where this potential new leadership will come from when a new uptrend emerges. 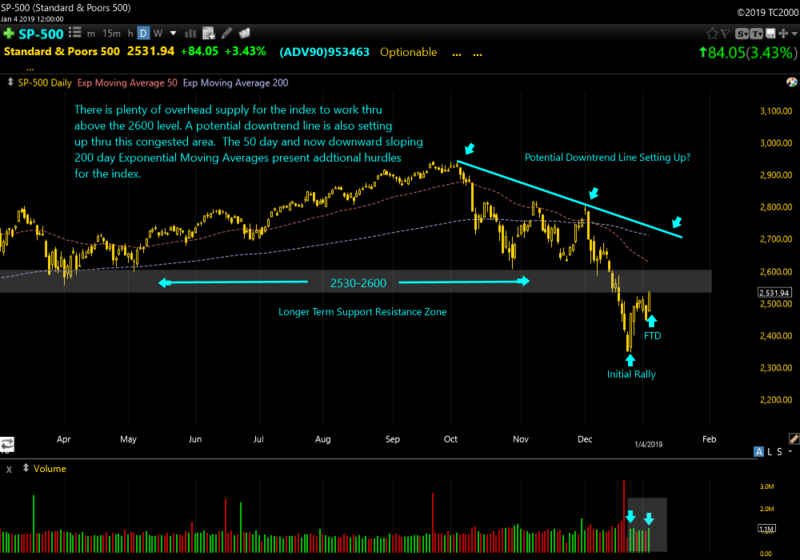 IWM- The small caps have been locked firmly in a downtrend since September and recently put the finishing touch on a round trip that saw the index give back all the gains chalked up dating back to the 2016 post election breakout. The good news is that the selling stopped there, aided by Wednesdays rally attempt. The index has posted three straight days of advances gaining around 7% in the process. However, the advance was turned back Friday afternoon near the $132-$134 area that marked a firm area of support for the index from late March to mid-August of 2017, so this area does have the ability to provide some resistance, at least in the short term. If you would like to learn more about trading using the CANSLIM investing/trading methodology, join us at our premium site, http://www.ttptrading.com Hope to see you there! OVERVIEW- The indices continued their recent dive this week all but guaranteeing that the major averages will finish the year in negative territory. Outside of the typical defensive groups like food and utilities, a couple of industry groups such as the software area in particular, were still managing to hold up relatively well trading near all time highs heading into the week giving traders some hope that there was some burgeoning leadership waiting in the wings to propel any new rally, but those stocks finally succumbed to the immense selling pressure late in the week. 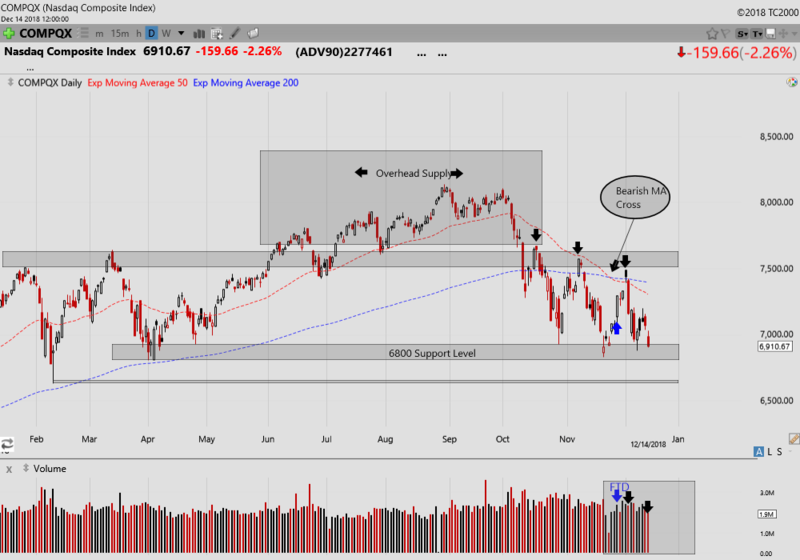 We will continue to look for a possible bottom with a newly confirmed rally, but most stocks have been severely damaged and it will take some time to repair the technical damage that has been done, even if we do get such a signal. I have said here many times that bear markets live below their 50 day moving averages, just as bull markets trend above them, and until the indices mount a serious challenge to that line on the heels of a newly confirmed rally, high cash levels and very selective trades on the short side are the focus. However, the degree and speed of the recent drop we have seen is making it extremely dangerous entering trades on either side of the market, so extreme caution is warranted right now. Traders must remember cash is a legitimate position and should have no reservations about sitting with very high levels until things improve. With indices breaking nearer term support levels, we will pan our charts back further in time using a weekly view to see where some of the next lines of support may lie should we continue lower. 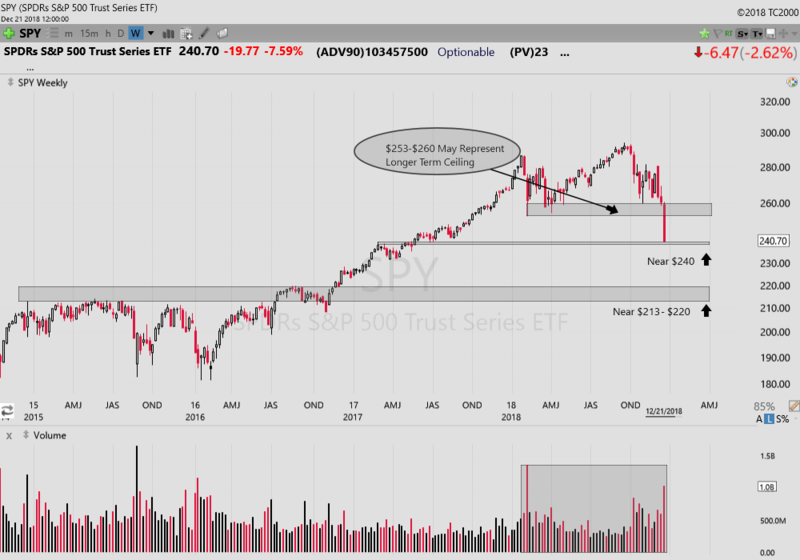 SPY- The index cut decisively thru support areas near $260 and $253 this week on its way to a loss of an amazing 7.59% for the week. In the process it fell all the way to the next major support area near $240 that represents the breakout that took place back in late spring of 2017. Beyond that, the 2016 post election breakout, would represent a complete round trip for the index should bear market conditions continue. If we take a look back at weekly volume levels for the entire 2018 trading year, we can see the large number of weeks when distribution took place in comparison to weeks when price advanced, and this ultimately undermined the prior uptrend. Looking ahead, any rally attempts from current levels will be burdened by the abundance of overhead supply that sits atop the $253-$260 area making upward progress in the near term extremely challenging. That said, markets winds can shift quickly so traders should stay diligent during these times and remain flexible and prepared should signs of a change in trend start to appear, until then the bull is broken and the trend is down. NASDAQ- The Nasdaq Composite is now down over 20% from its all-time highs set back in September, a bit ahead of the decline in the S&P 500 which is down around 17% and this stands to reason because the index will contain many more growth stocks in which corrections will generally be much more severe. The index shapes up very similarly to that of the S&P 500 as far as layers of support, but the index did stop at a level of support that lines up with a late summer break to new highs in 2017, whereas the S&P sliced right thru on its way to the aforementioned spring 2017 breakout level. Corrections in growth stocks can carry on much longer than some traders can stay solvent so cutting losses in any of these stocks traders may be holding is paramount to their survival. QQQ- The FANG stocks were a big driver of the recent bull train and they are painting a quite bearish picture of what may lie ahead. We had a high volume break below a long term trendline that dates back to early 2016. As we take a look at the volume pane in the chart below, what is striking is the heavy distribution that has been taking place on a weekly basis for the overwhelming majority of 2018. The resulting breakdown confirms that distribution. IWM- The Small Cap Russell 200o is now down over 25% from its peak and all that is left is to view the carnage. 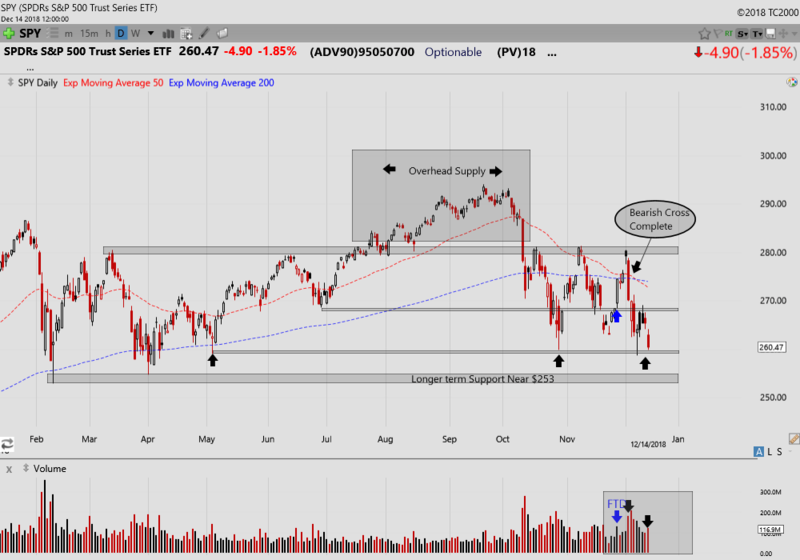 This index was the first to breakdown back in late September, so perhaps this more speculative area of the market will give us the first indications of when the markets may be ready to turn back around. I will warn however, that bear market rallies and retracements can be swift and severe so traders need to be very disciplined not to get heavily involved on the long side on any rally attempts until they are confirmed, and even then they should do so very slowly with lowered risk as there are no guarantees. Confirmed uptrends can and do fail as we have witnessed twice already in the month of November. OVERVIEW- The market gave the bulls some hope early in the week with a Monday reversal, but by the end of the week the bears won again, and did so in style on Friday as the indices were hit hard. 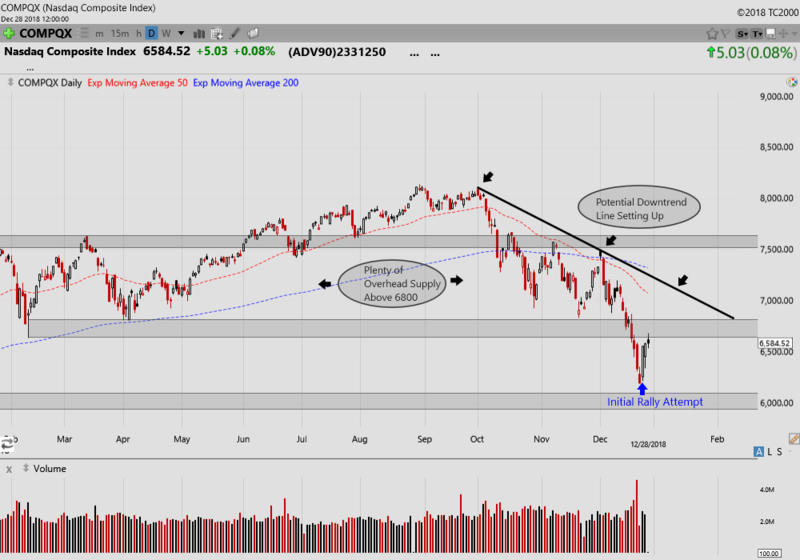 Similar to last week, our confirmed uptrend is technically in place as the Nasdaq Composite has not undercut its correction lows, but we are splitting hairs at this point and I can easily throw the indices collectively and officially back into correction mode with a two month downtrend firmly in place. Interestingly, distribution days on the S&P 500 and Nasdaq Composite have not been piling up, as they each show only two such days since the rally confirmation on 11/28. However, context is everything and the indices are clearly exhibiting bearish behavior and breakout attempts by leading stocks are continuing to fail at a higher rate. 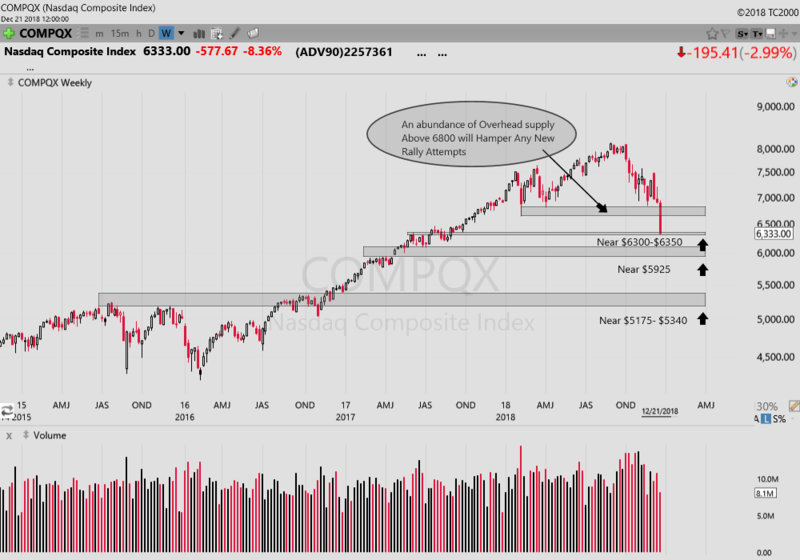 The Russell 2000 eclipsed some longer term support on Friday, while the S&P 500 and Nasdaq Composite are close to some inflection point themselves, so let’s take our weekly run through index charts to see where we are heading into next week. SPY- The S&P 500 ETF posted only its second distribution day since the 11/28 confirmed rally, but that’s not much solace for the bulls as a series of bearish reversal days plagued the index this week. The $270 area has recently contained any upside for the index, while $260 has provided support now for a third time since late October. Should that level not hold, the longer term support line near $253 which marked the lows of early 2018 correction, is the next line in the sand. The bearish cross of the 50 and 200 day EMA’s was definitively completed this week, but as we have mentioned in the past, this can sometimes be a lagging indicator marking a late sell signal and market bulls can only hope that this is the case this time around. The top 20 industry group list continues to be dominated by utilities, food, beverage and cleaning products, not the sign of a healthy market. NASDAQ- The Nasdaq Composite posted only a modest loss for the week of 0.84%, but it was the round trip behavior that was more of the concern for the bulls. 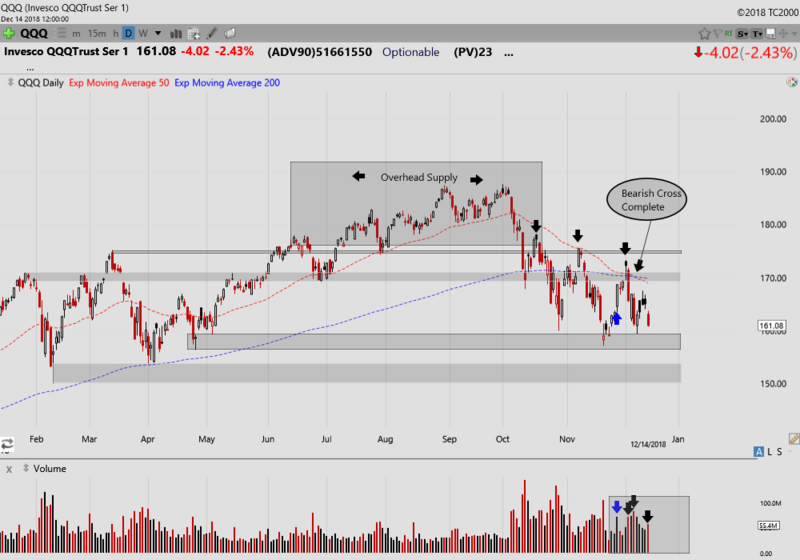 For the optimist, the index has only posted two distribution days since the confirmed rally on 11/28 and has not undercut the corrective lows keeping the uptrend technically in place, but its the action in individual stocks that traders need to look at in order to round out the picture, and things have not been good in this regard. Few leading stocks have been breaking out to news highs, while many that have tried have failed in their attempts. The 6800 level on the index, which is not too far off, lines up as important support, but if that line does not hold the bulls must try to make a stand at the February lows near 6630. * (Note that Telechart Nasdaq volume figures have not been reported accurately recently but distribution days on the charts are accurately represented). QQQ- The Nasdaq 100 has completed a bearish cross of its own this week and has three distribution days on the books since the most recent uptrend. Not surprisingly, index has suffered an almost identical decline as the Composite however, it sits more than a full percentage point above its correction lows. The bottom end of the next layer of support sits near $156.50, three percent below where the index closed on Friday. 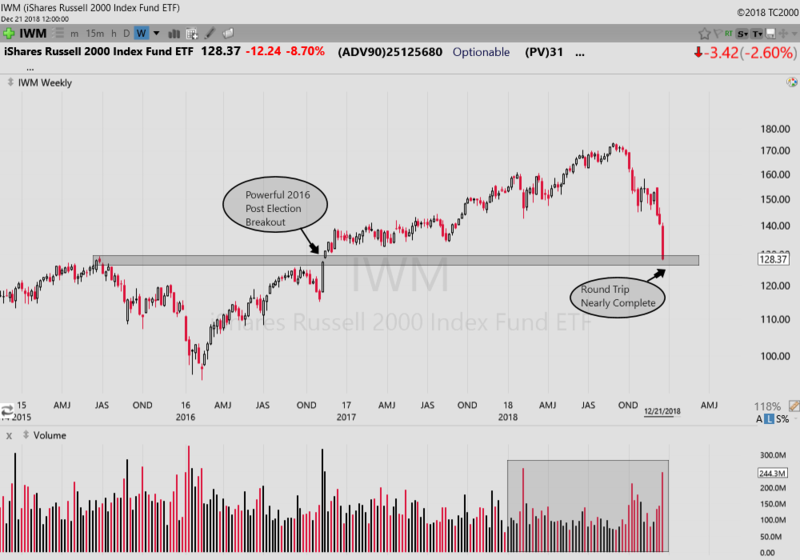 IWM- The Russell 2000 is now down nearly 19% from its August highs and on Friday broke through important longer term support near $142.50. 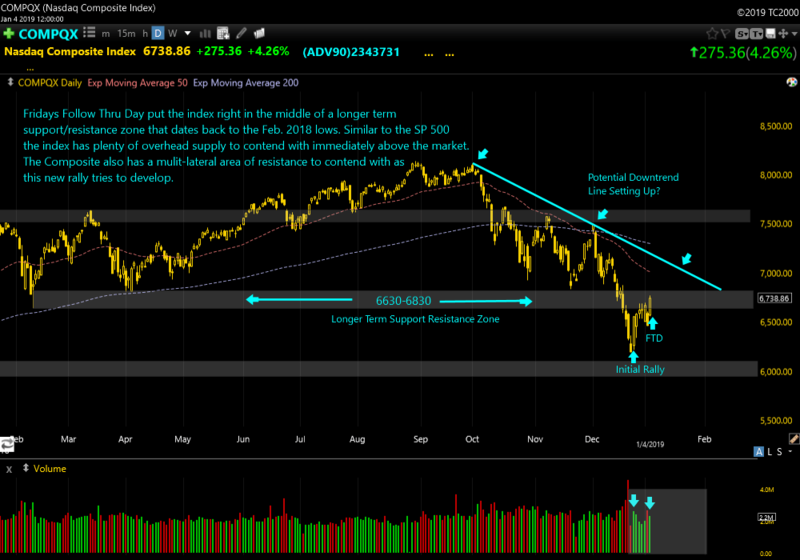 This index led the way to the downside and has clearly been one of the prime risk on, risk off indicators for the market. Traders should watch this index going forward as it may provide the first clue as to when the bearish tone of the market may come to an end. Should this recent breakdown in the index escalate, the next major line of support may not come into play until price approached the $132-$134 area. TWTR- Twitter is not quite the typical breakout pattern I look for, as I generally like stocks breaking out to new highs. However, some stocks present strong and compelling technical cases and Twitter also has attributes I look for fundamentally, as it sports a stellar recent sales and earnings record, along with a lofty 93 relative strength rating. The stock printed a text book head and shoulders pattern between March and August of this year however, instead of breaking down at the neckline, the stock has recovered having gained nearly 40% since mid- October. 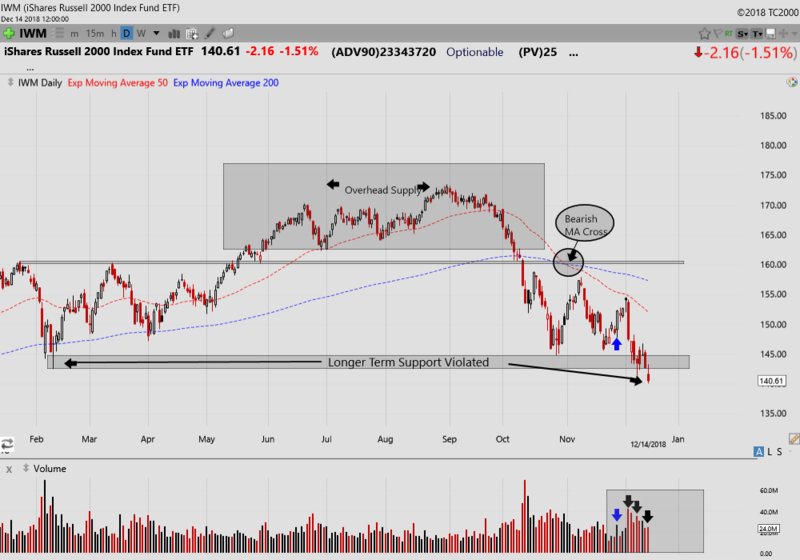 These “failed failure” patterns can sometimes offer gains in the opposite direction of the obvious technical set up, and the stock has already done this to a great extent, but perhaps more gains could be in store. Here we can see the stock is trying to breakout of a nearly five month sideways consolidation with a pivot point of about $36.30. 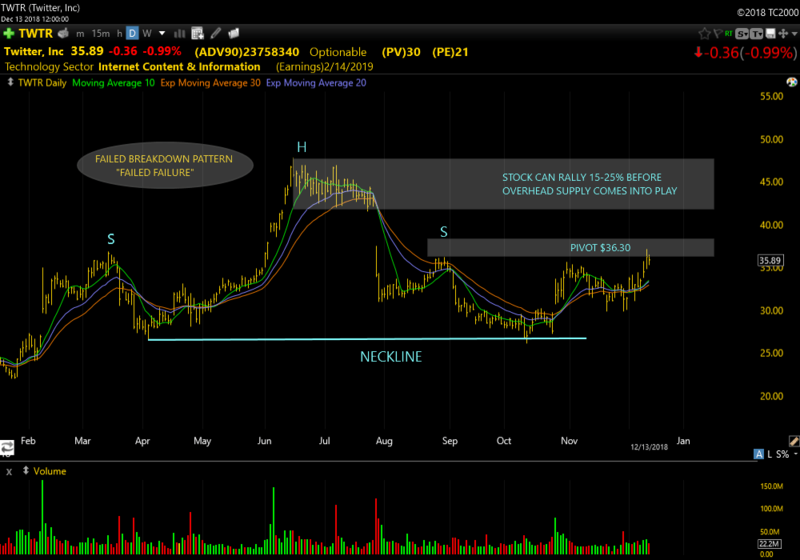 There is some overhead supply above, but should the stock breakout it can move 15-25% before that supply comes into play. The elephant in the room is the overall market conditions, so some serious consideration is in order before pulling the trigger on this, or any other long trade right now, but make a note of these failed failure type patterns and keep this one on your watchlist. If you like what you see here, join us at our premium site http://www.ttptrading.com for a Free 30 day trial.